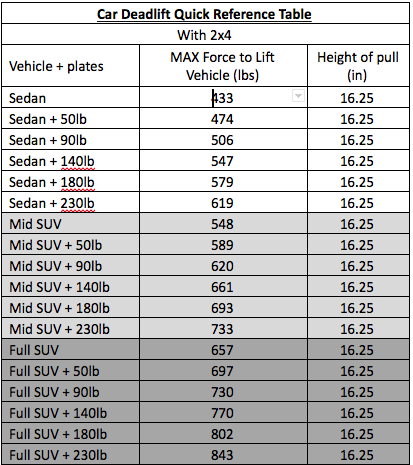 Home /Articles, Deadlift, Science Of Strongman/The Science of Strongman: How heavy is the car deadlift? How heavy is the car deadlift you say? This age old question has been a topic of conversation since cavemen first started deadlift cars and blogging about the paleo diet. There is no question that picking up the end of a beastly machine using nothing more than your own strength is a sight to behold, but the question remains: how much of the car are you actually lifting? We have all seen the video of Franco Columbu lifting a car out of a tight parking spot. Since most of us are in fact, not Franco Columbu, we tend to use mechanical aids like a car deadlift apparatus, straps, suits etc. 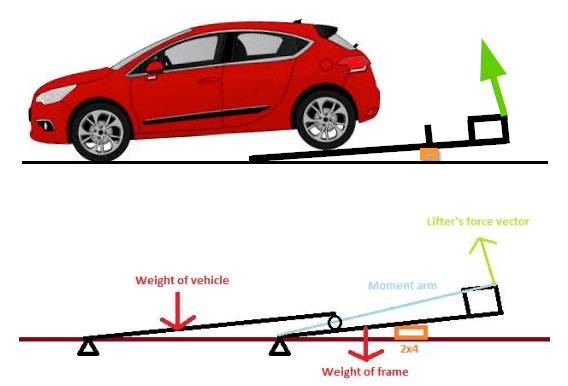 By only lifting the end of the car off the ground, and using a giant lever to do so, we are only lifting a fraction of the car’s actual weight. By modeling the car deadlift set up and applying some physics, we can calculate the actual force required to lift the car from the ground. I have chosen to model the system as 2 rigid bodies that are each fixed on one end. The car resting on the deadlift frame will be modeled as a roller (force always normal) and the theoretical moment arms will be used (since we are using the rigid body model). The entire system is basically a lever lifting another lever. Athlete’s pull is normal (perpendicular) to the theoretical moment arm: This means that instead of pulling straight up, you should pull slightly back in order to translate the most of your force into rotating the frame (Green arrow in diagram.) Keep in mind that your range of motion (ROM) is a segment of a circle. NOT a straight vertical line. Direction of pull: During a normal barbell deadlift, the only external force that you need to overcome is gravity. Since we all know what direction gravity acts, we can agree that you only need to pull UP. Because the car deadlift frame is a giant lever, the ROM is actually a section of a circle rather than straight up and down. Height of pull: A normal barbell deadlift sits 9” from the ground. The car deadlift frame handles sit over 16” from the ground (with a 2×4 under the frame). This shortens your ROM significantly. Hand positioning: A car deadlift frame forces your hands out wider than a barbell deadlift. This actually makes the pull more difficult by increasing ROM (think right triangles). The increase in ROM is offset by the fact that you are using a neutral grip which allows the athlete to be in a more advantageous position. During a barbell deadlift, the bar is in front of the athlete, creating an additional (and massive) torque to overcome. This is where the advantage of the neutral grip comes in. By using the frame apparatus, the athlete may now eliminate the additional torque created by the weight being away from the body. There is no direct conversion from a barbell deadlift to a car deadlift. The movements are completely different, and they should be treated as such. Other deadlift variations more closely mimic the car deadlift. Deadlifting a car is closely represented by a trap bar deadlift from blocks. This type of set up addresses 2/3 of the main differences between the barbell deadlift and the car deadlift (does not address the different direction of pull). It is an easy set up that can be performed in most gyms. If you are able to set it up, this is a closer representation. 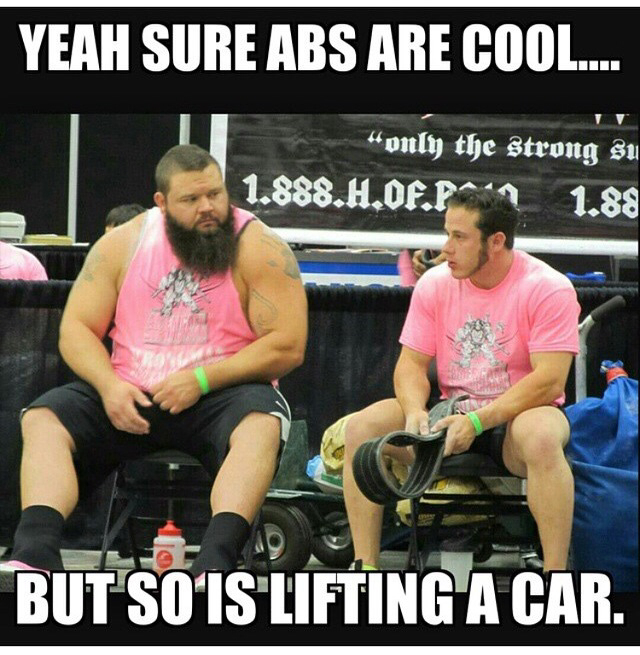 Obviously, having a car deadlift frame and a designated “lifting car” is the best way to train for a car deadlift in competition. 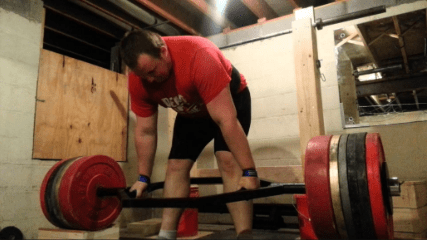 For those of us who don’t have a dedicated lifting car or access to the set up, we can at least understand the movement a little better, and tailor training accordingly. Deadlifting AT ALL is more than most humans can claim. Deadlifting A CAR is a feat of strength accomplished by an even smaller subset. Now that we understand the movement and know how heavy the thing is, we can draw the conclusion that deadlifting a car is really friggin’ cool. Mark is a lightweight amateur strongman, long time powerlifter, practicing mechanical engineer and owner of your favorite stone sleeve company, 4Armour LLC. 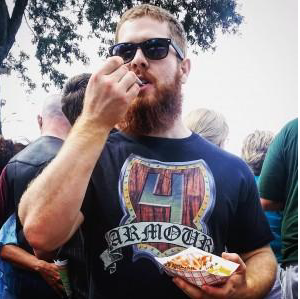 As a student at The Pennsylvania State University, Mark studied mechanical engineering, mechanics, red beard growing and was an athlete on the Penn State Powerlifting team. Since then, Mark has been working in product development, and directly applying his knowledge of physics to lifting smarter both in the gym, and wherever heavy things may be hiding from him.